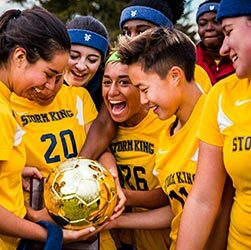 Athletic Director and Head Soccer Coach Joseph Graziosi is pleased to announce that Storm King’s boys varsity soccer team was awarded the Western New England Prep School Soccer Association Sportsmanship Award for the 2018 season. The criteria for the award is total points on red and yellow cards and ratings from opposing coaches for each match played against WNEPSSA opponents. This constitutes virtually all of SKS’ matches.